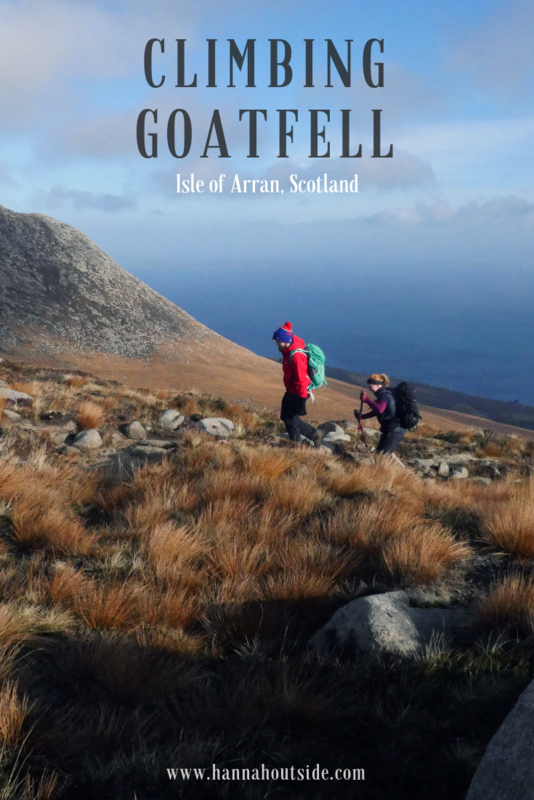 Goatfell is the largest mountain on the tiny little island of Arran in Scotland. It’s a nice pointy peak – a satisfying mountain to look at, as we discovered on our visit last year. As you arrive my sea on the ferry, it looms up over Brodick drawing your eye and tempting you to pull on those walking boots. On our walk of the Three Beinns last year, we could see it for a large proportion of the walk and it was a tempting sight (as you can see below) so there was no doubt about which walk we would be doing on our second visit. We had a couple of choices when it came to our route but, as this year has been a slow year in terms of health and fitness and as it was the first time we’d head to the mountains with our newest addition to our household, Flo, we opted to play it safe and rather than summit via the more exposed North Goatfell, we took the gentler route up Meall Breac. 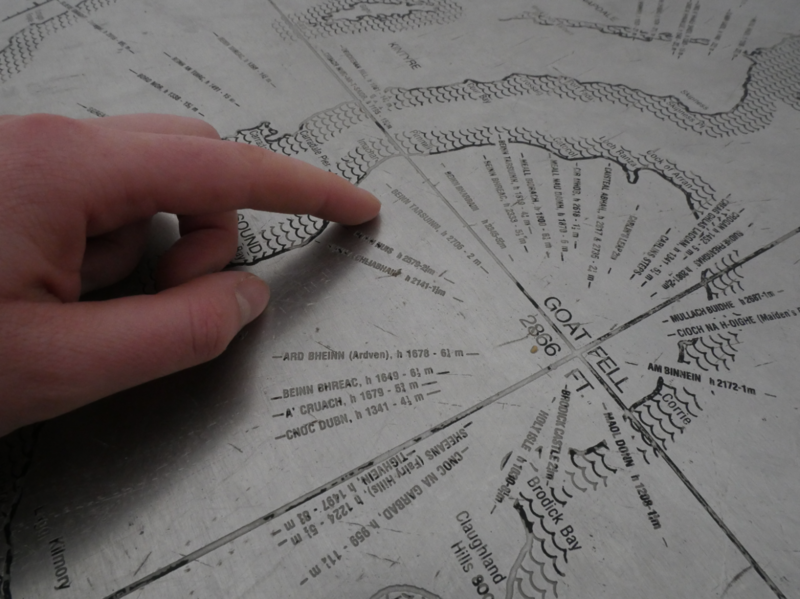 Rather than doing a linear route, we parked one car at Brodick and then set out for Corrie for the start of the walk. Starting out with a sharp climb up from the road for the first five minutes the road merged into a single-track path following Corrie Burn. We crossed the deer fence and that’s when the climbing began. 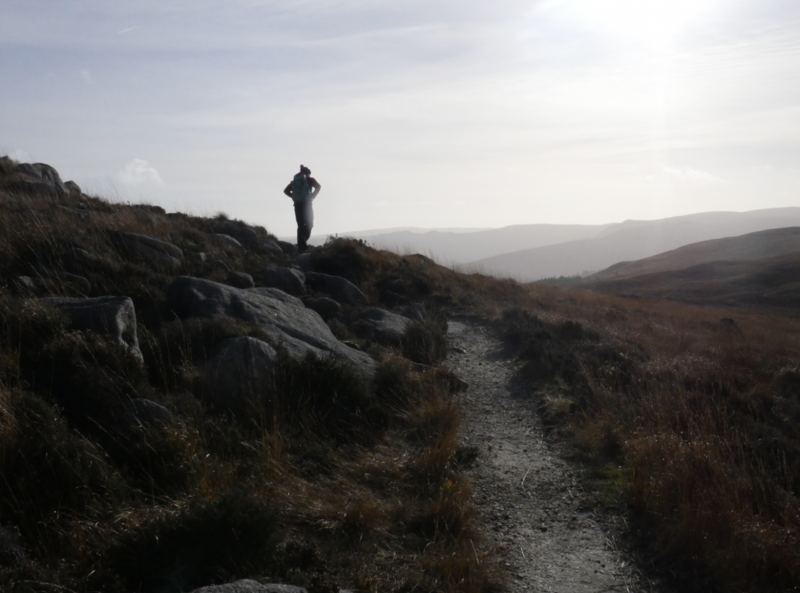 Unlike some of the paths on the Three Beinns walk on the other side of Glen Rosa, the path was crystal clear – making it very easy to follow. Reaching a fork in the path we had an opportunity to stop and decide where we wanted to go next. 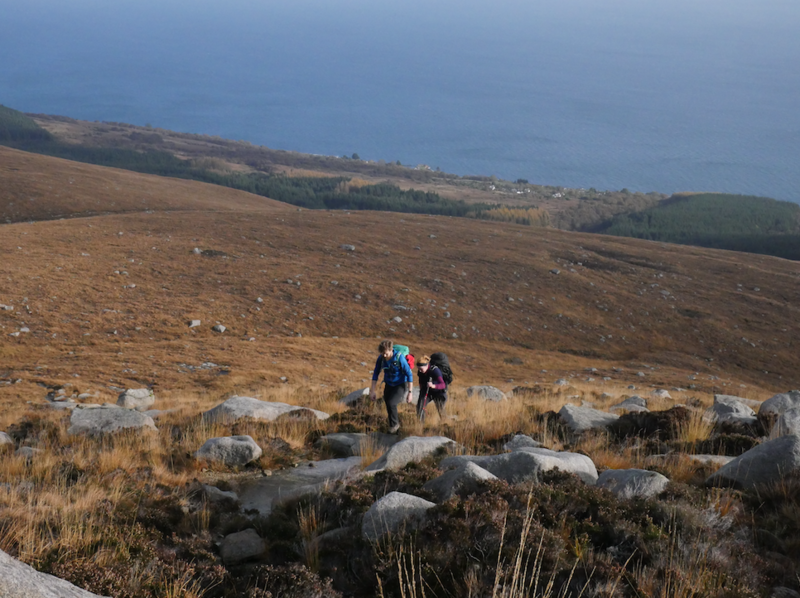 Looking to our right we could continue up Corie Lan and into the col between Mullach Buidhe and North Goatfell. Having opted to not go up via North Goatfell and across the Stacach in the first place it was nice to have the option to do it if we wanted from this route, however, the cloud was low and visibility obviously wasn’t good over there. Sticking to our gut and reasons that we had already decided upon we a) wanted to do it in good weather and b) it was the dog’s first mountain and we didn’t know how she’d respond (judging by how she was on this walk, she’d probably be fine), we decided to take the second route to our left. 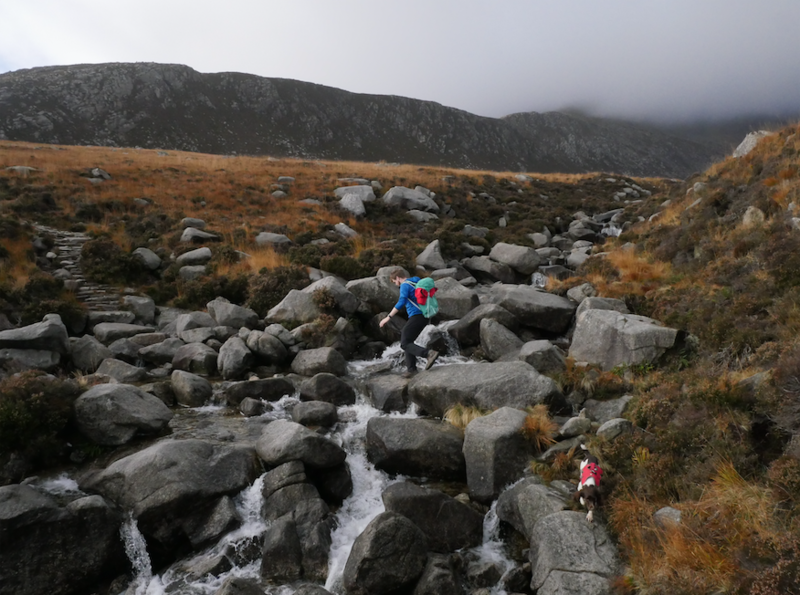 Decision made, we dropped down into a gully to cross Corie Burn. While much smaller than the river we’d followed down the hill, it was still rather full. This didn’t stop Flo from running back and forth, hopping from rock to rock, hurrying us all across. River crossed we set out on the next stage of the climb, up Meall Breac. I tell you – having been away from the hills for a while this year, I felt this climb in my whole being. It was tough but as we came over the brow and onto the back of the ridge, that was all forgotten. This was the kind of terrain that made me love Scotland. It was wide, covered in golden grasses, heather and large boulders. The views were wide, down to the sea and over Brodick and the Holy Isle. We were heading into the cloud for the first time as we started climbing again, but I didn’t care this time. My spirits were high at being in such a wonderful place and being outside and doing something that (I remembered) I love, despite the initial hurting to get there. 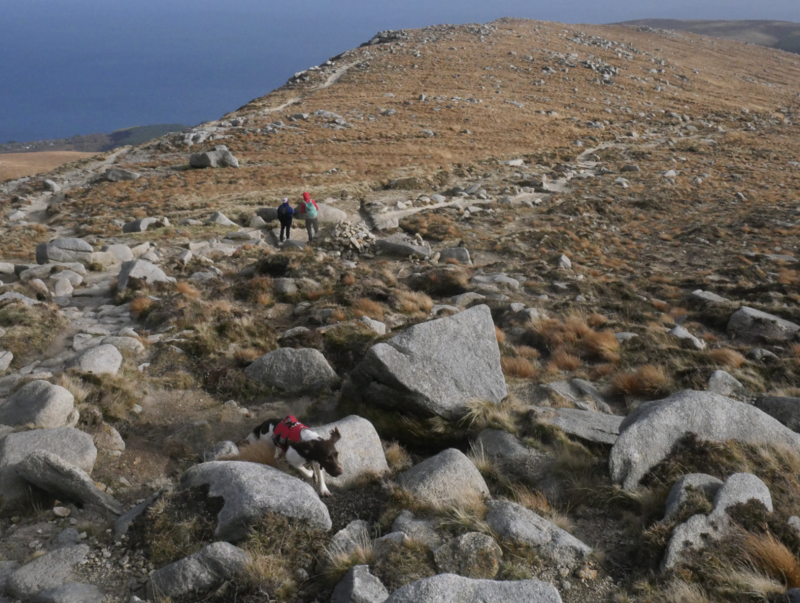 We were now on the last part of the climb – onto Goatfell itself. Out of nowhere, we were hit by a sharp blast of wind, and then another. We’d gone from happily strolling along to being nearly bowled over. With every step we took the wind threatened to sweep us off our feet but, ducking in and out of the boulders on the path, we continued to climb. 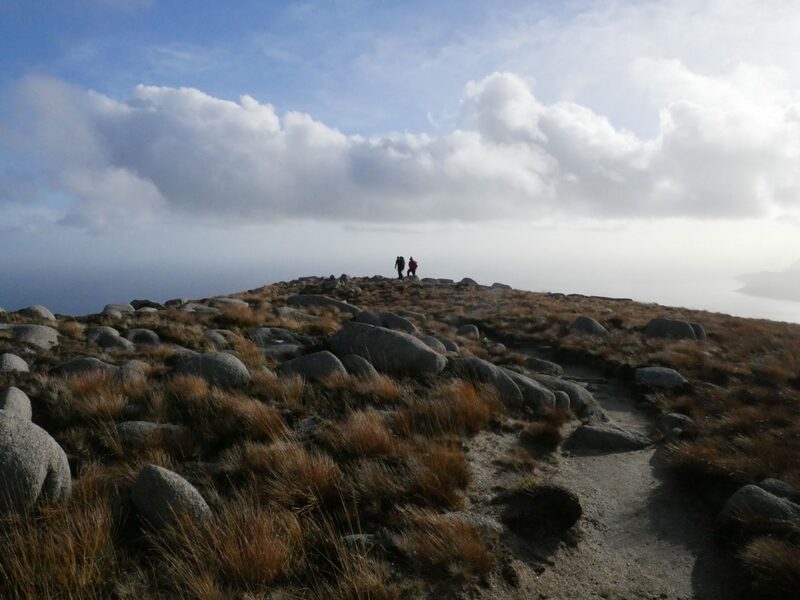 It wasn’t long before we reached the summit and the wind mysteriously disappeared, as though it had only been a test to challenge your perseverance before it allowed you to reach the summit. 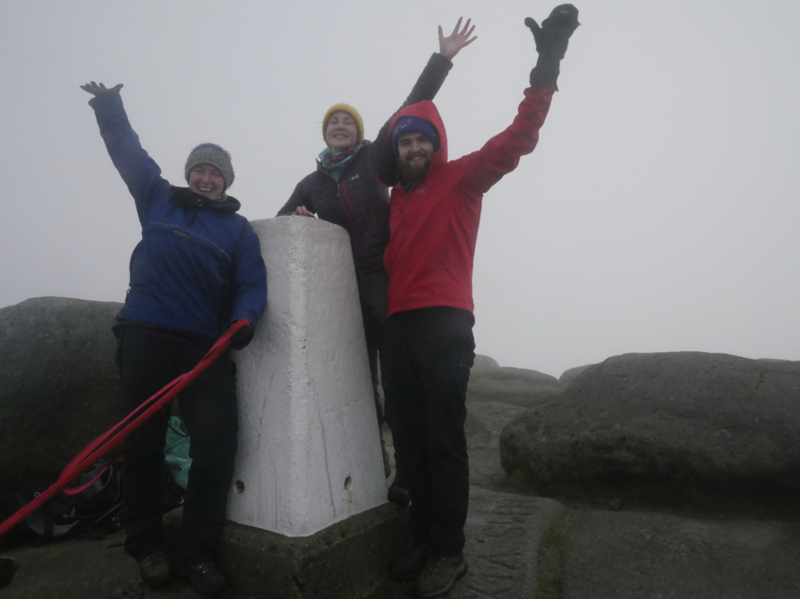 We rounded a corner and there it was, the summit with its trig point and a navigation board pointing to the surrounding landmarks. I’m sure the view would have been wonderful had we not been surrounded by thick cloud. I’d been really hoping to catch a look from above at our walk around the Three Beinns last year. 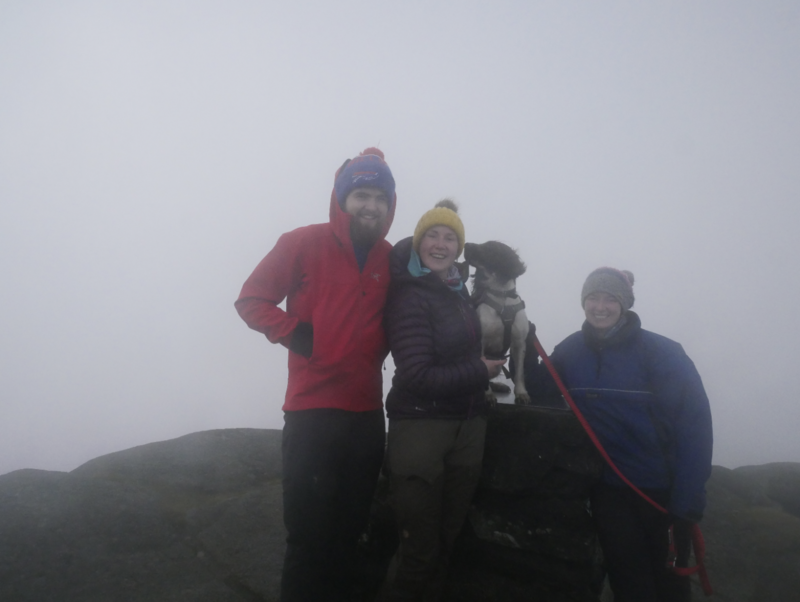 Yet it was fine, we had the summit to ourselves (bliss!) 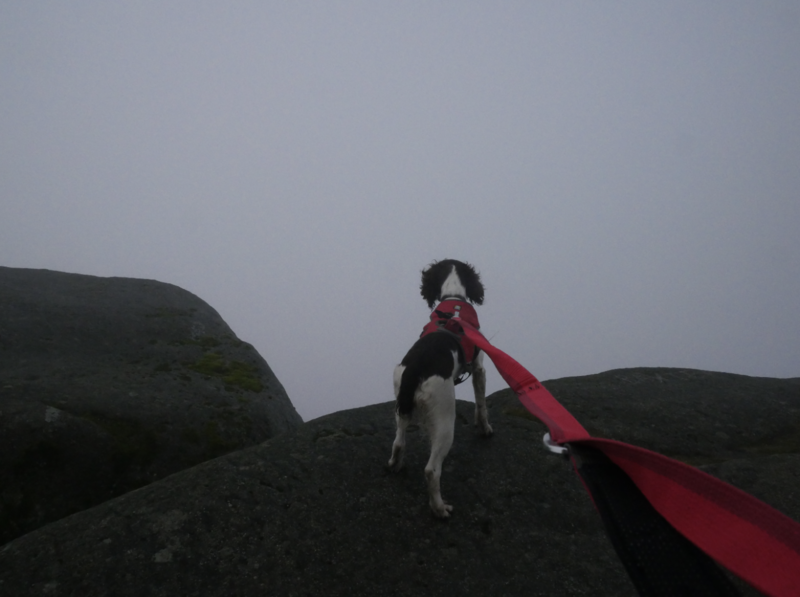 and it was amusing watching the dog figure out where she was, obsessed as she was with looking over the edge and into the swirling cloud. After hanging around for ten minutes or so hoping that the cloud would clear we admitted defeat and accepted that we needed to get moving to warm up so started our descent. 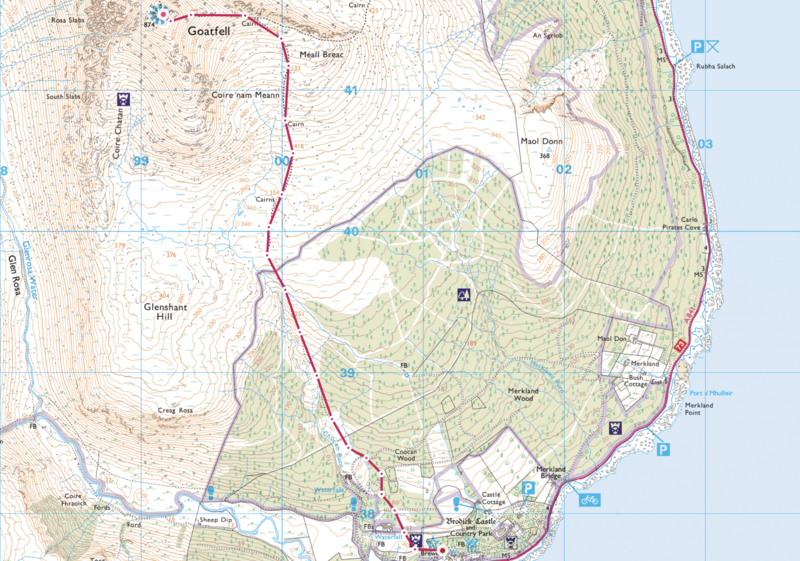 While we would be taking the same route down initially, we would split off to our right and take the path down to Brodick. As I mentioned before, the paths are so clear, you’d have to have to be in very very bad weather to miss it (that’s not an excuse to not take a map and compass). The descent was gentle and the ground easy to negotiate. As we crossed the deer fence again the path turned to gravel before crossing a bridge and dropping into forestry, truly beautiful in its autumn shades. 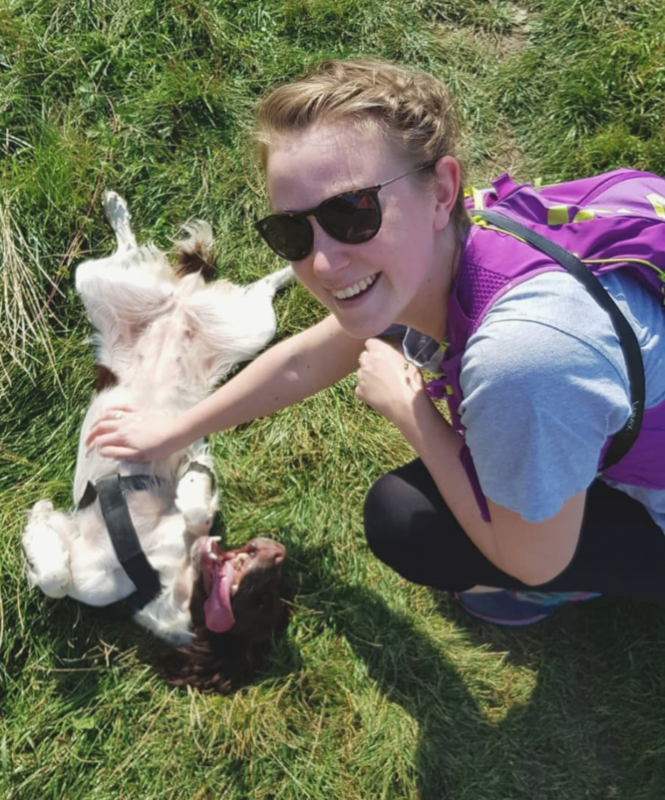 It was a good walk and a nice taste for somebody who’s not overly familiar with the mountains to have a go at. If you’re someone who spends your life in the mountains then don’t dismiss it – the summit is great and it’s still a nice morning’s walk. 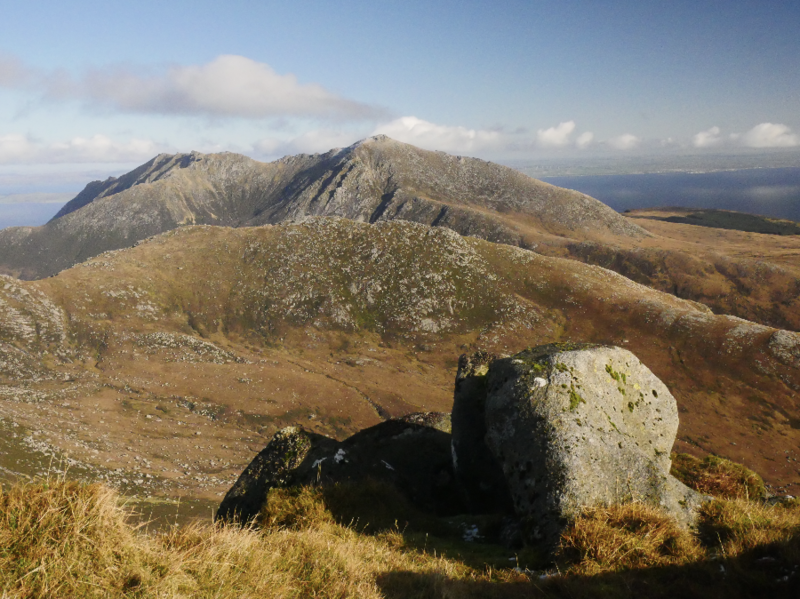 Plus it gives you (in theory) a great view over Arran – just don’t expect it to feel overly wild and remote. Yes, but I’d love to have a go at it from North Goatfell. We set off about 9am and it took us roughly four and a half hours at a leisurely pace with stops for snacks and lunch (and our long wait at the summit!). We parked one car at the Wine Port in Brodick and left the other in a small layby in Corrie. Where can I go to eat after the walk? 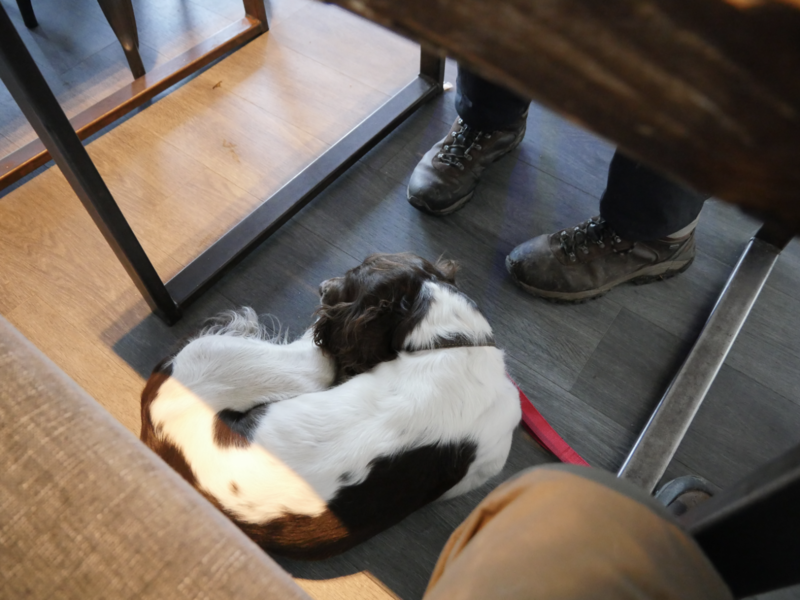 We headed back into Brodick to our favourite Little Rock Café. This place is worth checking out as they do really good food, good coffee and (although I can’t drink them) I am reliably informed the milkshakes are the business. Plus, they take dogs! There are other places to eat, of course, but many were shut due to the winter season. 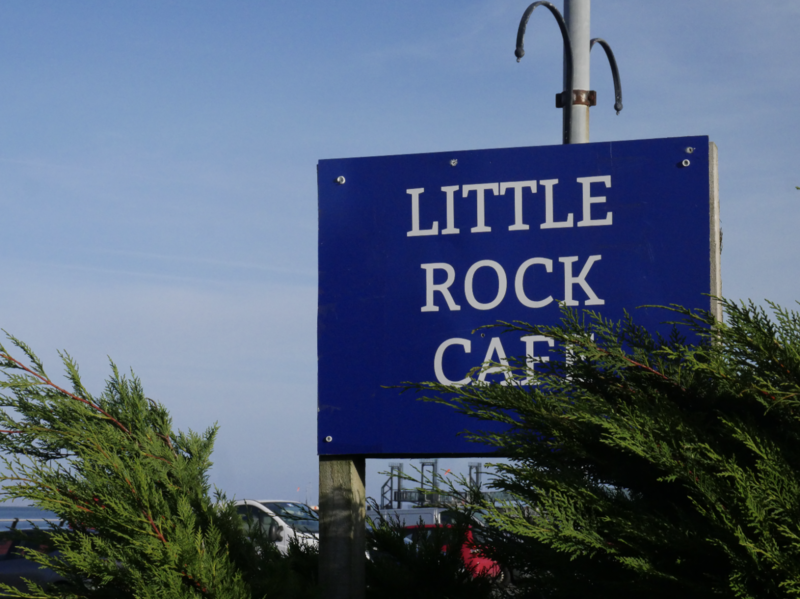 Plus, we loved Little Rock so much and it was in our price range, while allowing the dog. Do let me know if you find somewhere else to go!